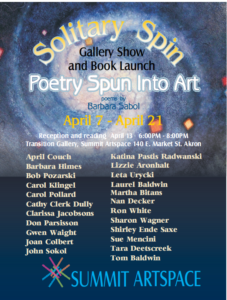 Twenty-three local artists have created artworks based on the new poetry book, Solitary Spin by Barbara Sabol. This show will be a combination of a gallery show of artworks and book launch for a new poetry book publication. Solitary Spin runs April 7- 21 in the Transition Gallery of Summit Artspace, 140 E. Market St., Akron. The show is free and open to the public. The exhibit represents a marriage of visual art and poetry, created by some of the most accomplished artistic talent in the area. Come hear poet Barbara read at a reception on Friday, April 13, 7 pm, surrounded by the illustrations. Ms. Sabol and the artists welcome you to a reception, 6-8 pm, to meet and share reactions. Artists featured: April Couch, Katina Pastis Radwinski, Ron White, Joan Colbert, Lizzi Aronhalt, Tom Baldwin, Barbara Himes, Bob Pozarski, Carol Klingel, Carol Pollard, Cathy Clerk Dully, Clarissa Jacobsons, Gwen Waight, Don Parsisson, John Sokol, Leta Urycki, Laurel Baldwin, Martha Bitans, Nan Decker, Sharon Wagner, Shirley Ende-Saxe, Sue Mencini, Tara Deetscreek, Tom Baldwin.